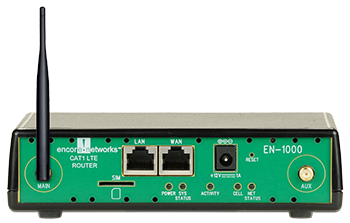 When paired, the "EN-1000™ on CAT1" becomes the ideal replacement for sunsetting 2G cellular data services. For the existing 2G applications facing transport extinction, the EN-1000™ provides a future-proof upgrade that avoids the “forklift” at lowest cost and fastest ROI. It is the perfect solution for mission critical low bit rate transport requirements. Its small footprint lets it fit into kiosks, tight retail spaces, and crowded offices. The EN-1000™ supports high-availability in fixed or portable locations and can be used as either a primary or back-up connection eliminating the high costs and challenges of network outages. Used as a back-up, when a wired connection goes down, the EN-1000™ keeps applications online by quickly switching to wireless, eliminating the risk of lost business due to downtime. The router will fall back from a traditional (wireline) broadband service such as DSL, cable modem, and Metro Ethernet to a cellular data network. 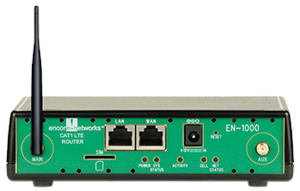 The EN-1000™ detects a network failure and seamlessly switches to LTE, and will preserve multiple VPN tunnels and VLAN support. This Disaster Recovery and business-continuity feature is standard. As a primary connection, the EN-1000™ can be installed where it is not practical, or cost effective to use traditional broadband technology.